The beige Cat5e RJ45 Modular Inline Coupler from StarTech is designed to link several line cords together or extend the modular cable runs. This inline coupler provides a female-to-female feed-through connection to hookup cableseasily. It is a dependable and durable device that offers a practical solution for joining two RJ45-terminated cables together to form one long cable. 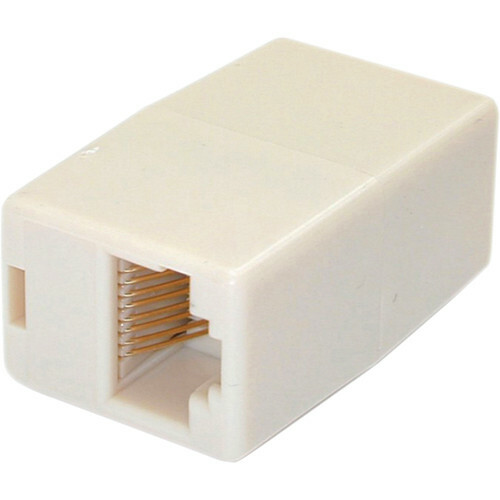 Box Dimensions (LxWxH) 4.0 x 3.0 x 0.5"
Cat5e RJ45 Modular Inline Coupler (Beige) is rated 5.0 out of 5 by 2. Rated 5 out of 5 by Alibeneck from Cat5e RJ45 Coupler This is something that every tech should have in their toolbox. Rated 5 out of 5 by Grafton from I would definitely buy this again. The Coupler works great. I had a short ethernet line coming out of the wall and needed to entend the connection to my Mac. I connected the coupler to the ethernet cable, connected my other cable to the coupler and voila, signal to my Mac.